With over 15 years experience, Rich Harvey and his team at Harvey's House Painting have committed themselves to remaining a leader in the residential and commercial painting industry. 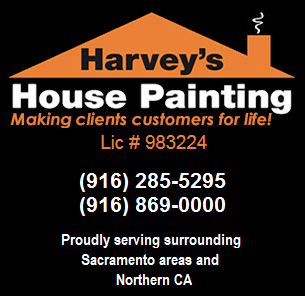 Harvey's House Painting provides a standard of service that has remained unmatched by any other painting contractor in the Sacramento area and Northern California. At Harvey's House Painting, it is our goal to continue to build relationships with each of our clients that last for years to come. Below you can view what just a few of our previous clients have to say about their experience with Harvey's House Painting. We also invite you to click on the Yelp logo provided and tell how we are doing. These guys just finished painting my house and I am very satisfied with their work. I had to wait about three months as they have a busy schedule, but the wait was well worth it. The price was very fair and the employees were polite and cleaned up everyday when they were done. I'll hire Richard again in the future if I need another paint job. We hired Harvey's to paint the exterior of our house. We had to wait a bit to have the work done, but it was worth it! They did a fantastic job! They showed up when they said they would and finished as planned. When they were finished, they cleaned up everything. We didn't have to pick up anything! I had other bids for the same job and Harvey's price was more than fair and the quality was top-notch! After it was completed, they called to make sure everything was to our satisfaction and told me to call them if we found any problems or areas needing touch ups. I highly recommend Harvey's House Painting! These guys painted the exterior of my home about two weeks ago. They started out a little slow but finished the job very strong. They used the best quality paint and with no water down to stretch the paint. These guys are professional and friendly. I searched for areas on the house that they may have missed or did not give much attention. I found noting but excellent workmanship. Do yourself a favor and hire these guys to paint your house. They are the best. Harvey's House Painting crew just left and I am thrilled with the job they did. We had the interior of our home painted and its gorgeous.We had to wait for a couple of months to get on the schedule but it was well worth the wait. The job took three days and each evening when we got home everything was cleaned up as if no one had been there. Very professional crew, perfectionists when it comes to the details, and they even put the furniture back in place. Highly recommend Rich Harvey and his crew. I highly recommend Harvey's House Painting. They painted the whole interior of my 2600 square foot home in custom colors and then returned two years later to paint whole house new baseboards. Service was prompt and reliable. I would hire them again. We look forward to earning your business. Please contact us today!